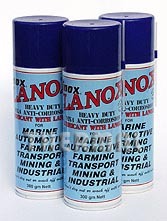 Inox & Lanox make an exceptionally high quality range of lubricant sprays and greases. The range has a reputation for high quality and reliability in numerous industries around the world. Used in service and manufacturing industries such as Automotive, Aviation, Agricultural, Electrical, Mining, Transport, Commercial, Fishing/Boating and the Food & Beverage Industries, to mention just a few. For use in cars, motorcycles, boats, trucks, buses, aviation, farm & earth moving equipment, industrial, solar and stationary batteries. NB. Inox battery conditioner is not a cure all , it will have little or no effect on mechanically unsound batteries. The only lubricant in the world with the special mx3 anti-corrosion, anti-moisture formula for the twenty-first century (MX3FG is also Food Grade Approved). Inox contains no silicon, acid, kerosene or dieseline. It will not harm metal points or surfaces, plastics, paints, enamels, fibreglass, formica or neoprene seals. 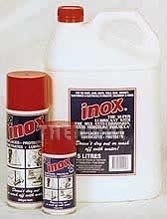 Inox doesn’t dry out, gum up, become sticky or wash off with water! Inox is non- conductive, non-static, non-toxic, non-corrosive and non-staining. Designed for heavy industrial, mining, farming, marine, earth moving and transport type use and where extreme climatic and high humidity conditions prevail. Lanolin is a natural wax found in animal wool especially the wool from sheep, it has wide spread uses, cosmetics, medical, soaps, etc. Although we supply Inox, a quality anti-corrosion lubricant, there are areas where a lanolin based anti-corrosion lubricant like Lanox is sometimes better suited for the application at hand. Lanox is a heavy duty anti-moisture, anti-corrosion lubricant made with a high grade lubricating oil and lanolin base with specialized chemical compounds. It contains no silicon, kerosene. acids or dieseline and is harmless to metal points & surfaces, plastics, painted & enamel finishes, fibreglass, formica, rubber or neoprene seals. Lanox doesn’t become sticky, gooey or gum up and does not dry out or wash off with water. It is non-conductive, non-static & non-corrosive. Extreme pressure lubrication. Superior penetration. Quality anti-corrosion protection. Inox mx5 Plus has been designed for applications where a superior extreme pressure, anti-corrosion, anti-moisture liquid lubricant, a high grade penetrating oil or an industrial quality machine cutting lubricant is required (Safe to use in saw, lathe & milling reservoirs). It has been specially formulated by adding a high grade friction modifier – polytetrafluoroethylene (PTFE) – to the original Inox base formula. PTFE is premium grade extreme pressure anti-friction medium which gives increased lubrication ability between the contact surfaces. This reduced-friction environment also lowers operating temperatures. Inox mx5 Plus will not harm metal points or surfaces, fibreglass, Formica, painted or enamel finishes, plastics or neoprene seals. It will not become tacky, alter surface tolerances, dry out or wash off with water. It is non-toxic, non-conductive, non-corrosive and non-staining. Inox mx5 Plus is Food Grade Approved (Type A) Australia. 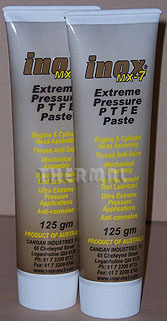 Extreme pressure – high temperature (no melt) food-grade approved machinery grease with polytetrafluoroethylene (PTFE). 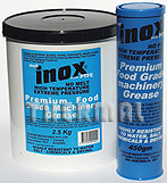 Inox mx6 is a fully synthetic, extreme-pPressure grease formulated to give premium performance and food-grade purity. This grease is composed entirely of ingredients which meet the requirements of section 178.3570 of the US FDA regulations, have been cleared for use within registered establishments by the US Department of Agriculture and will not deleteriously affect meat or meat products. Inox mx-7 is specially formulated Extreme Pressure Lithium based grease containing a high percentage of Polytetrafluoroethylene (PTFE) designed for Ultra Extreme Pressure Lubrication and where tough Thread Anti-Seize applications are required. Inox mx-7 provides high film strength, protects against start up damage in new and reconditioned machinery after long down periods before initial start-up. Inox mx-7 gives long term lubrication to parts and machinery that are difficult or impossible to lubricate after assembly while allowing for more even torque pressures and faster breakouts of joints, gaskets and threads and contains anti-corrosion additives.